What exactly is that which some Crete holiday villas offer to their guests, so they are considered to be among the best and more popular villas of the island? What is that a modern traveler, who is travelling to Crete, is looking for? Most guests are looking for a holiday villa where they will feel like they are in home! It doesn’t matter whether the villa offers luxury or is more simply decorated, whether it offers sea or mountain view, how many guests it may host – all these depends on anyone’s tastes and requirements. What matters is to be cozy, comfortable and offer warm moments with family or friends to its guests. The Cretan hospitality offered by the villa host, combined with the services and facilities that the guests enjoy during their stay were the main criteria to create a list with our most popular Crete holiday villas. 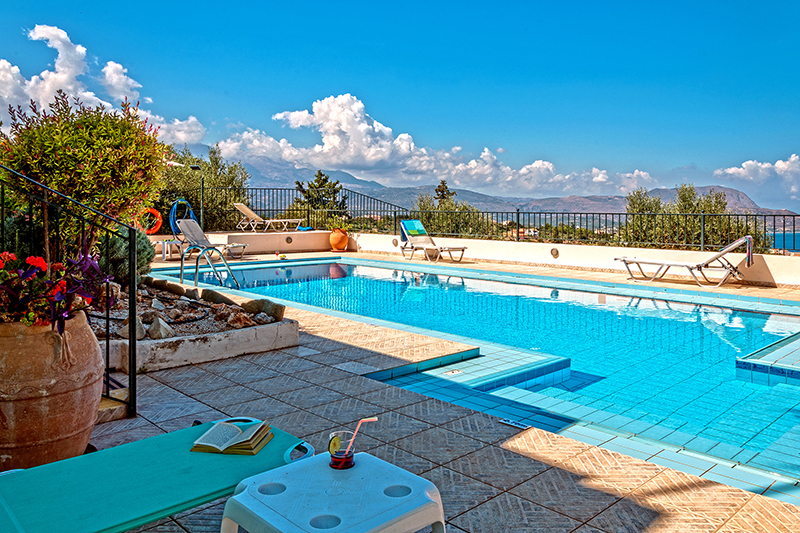 This private pool holiday home could be listed at the top of our Crete holiday villas list! The villa futures 3 bedrooms, 2 bathrooms and can comfortably host up to 6 guests. 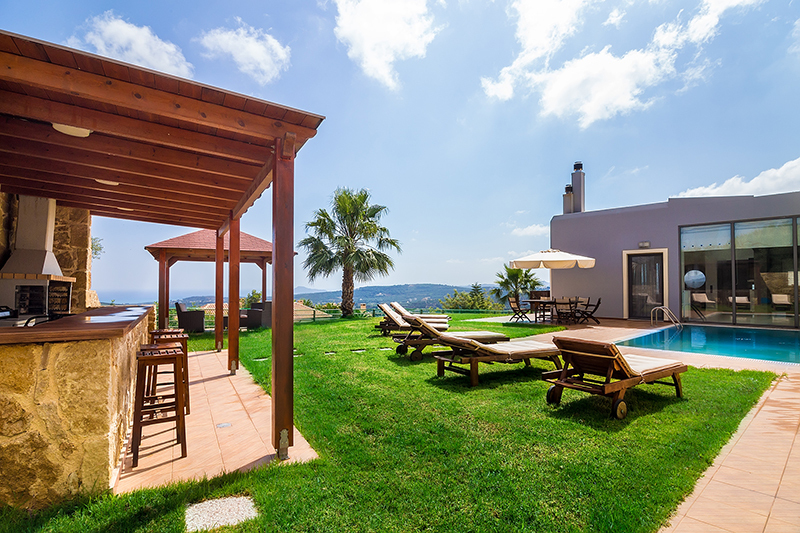 It is an individually designed Mediterranean style villa which has breathtaking and unobstructed views across Souda Bay towards Chania and across to the Rodopou Peninsula with the spectacular White Mountains all in one eye-line. Located between the traditional villages of Kambia and Kokkino Chorio in Apokoronas, it is only 5-15 min. driving from Plaka, Almyrida and Kalyves where there are taverns, shops and really nice beaches. The farmhouse is a one-storey building with a surface area of 140 square meters, includes 2 bedrooms, a large living room, a kitchen, a bathroom and a swimming pool. The estate on which the farmhouse is situated is in a green haven of 60 hectares with 2500 organically grown orange trees and is 13 km from the town of Chania. 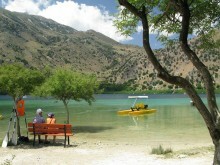 The lake of Agia, one of the natural landmarks of Crete is just 1 km away. The estate has 2 wells, fruit trees, an organic vegetable patch and foot paths. It is enclosed by a stone wall and secured with iron doors. There are 2 permanent staff members who look after the estate and the farmhouse and wait on its visitors. Charming, private gem! We, a family of three, spent a fantastic week at the orange farm. The house had everything one could wish for including a very nice pool. The farm’s caretaker looked after us, and spoiled us with fresh vegetables from the farm. The location was perfect – away from all the tourists yet with shopping and restaurants only a ten minute drive away. Listed high in the list of the top Crete holiday villas, the villa can accommodate 8 people in an area of 140 sq.m., with 3 bedrooms and 2 bathrooms. The private swimming pool is surrounded by spectacular views and features outdoors shower BBQ facilities and a comfortable sitting/dining area. Also, free beach towels and pool accessories for kids and babies are provided (life jackets, water toys, etc). 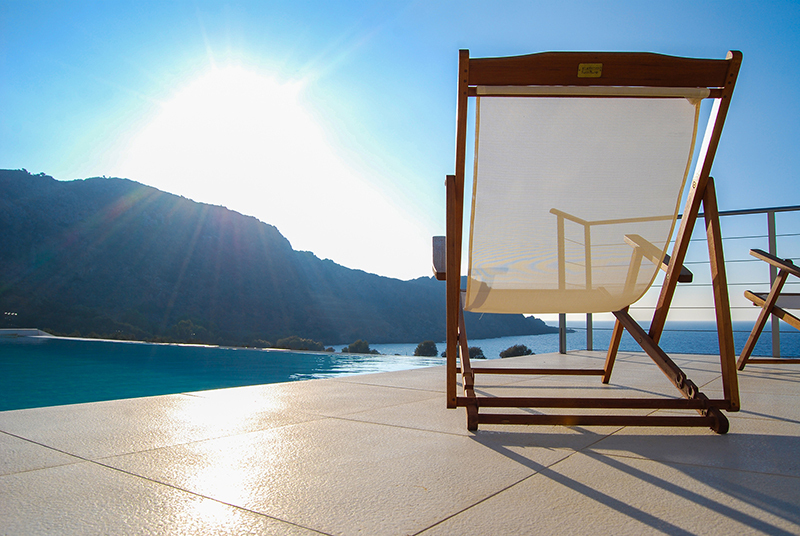 You will enjoy pure relaxation in the heart of Crete. The villa is located at the top of Amari Village, overlooking a valley of unspoiled natural beauty and excellent climate; an ideal spot for visitors who wish to get away from the crowded tourist areas, but at the same time to be close enough to visit them. Perfect summer holiday! We have just returned from a fantastic summer holiday at the Amari Villas. We rented Villa Idi as a stand alone villa for part of our stay and Villas Idi and Samitos together when we were joined by friends and their families during our stay. 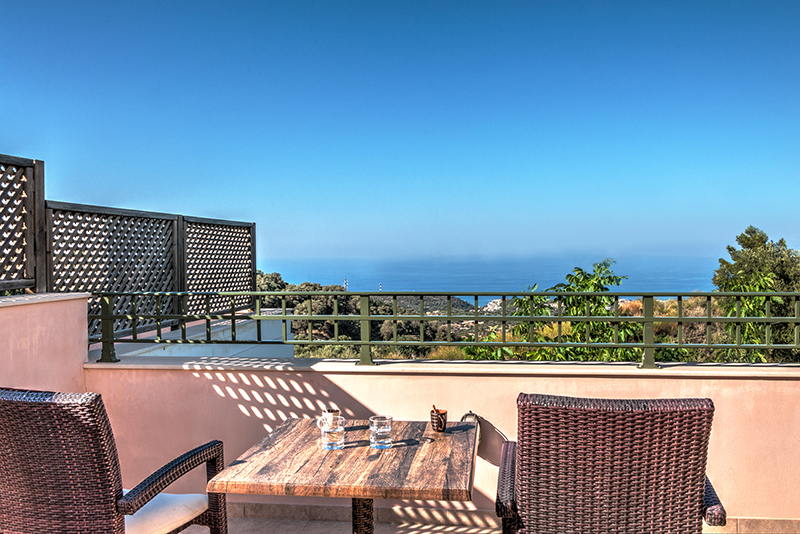 Amari village is located in a dramatic and beautiful landscape with amazing views from both villas. The setting is peaceful and allows for complete relaxation. Both villas are superbly equipped and have been designed and refurbished to an extremely high standard. We have stayed in rented villas in Turkey, Spain, Italy and France over the past twenty years. What really sets Villa Amari apart is the brilliant information and advice from Manolis (who was very flexible with our varying group sizes and arrival times) and the housekeeper, Mrs.Rumy who lives in an apartment below Villa Idi. As well as looking after all our needs (advice on where to buy bread, vegetables etc. ), she cooked us some fabulous meals and supplied very drinkable red and white wine as and when required. Thank you Manolis and Mrs.Rumy for making a fantastic stay even better – we will be back! 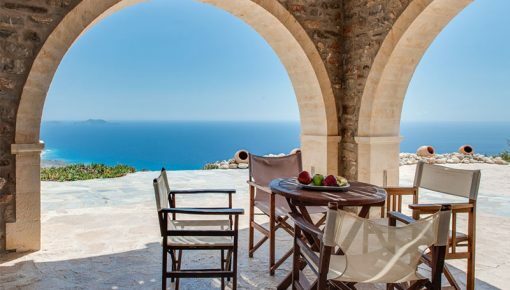 Listed among the top Crete holiday villas, this dreamy villa can accommodate 6 people, 4 of them in two double beds and the other 2 in ordinary single beds. All villa’s rooms future air conditioning. Also, there is a private pool and a balcony. Both double bedrooms have private bathroom, balcony and Jacuzzi. Sfinari village, in Kissamos, is situated 57 km. south-west from the center of Chania. Quietness is one of the basic advantages of this untouched place. Ideal for family vacations, far away from the noise and the crowd. Wonderful place, really nice view! The pool is separated with a place for kids which is just perfect. I strongly recommend this house. Service has been perfect, nice beaches within 30 min by cars. We spent wonderful holidays there. The villa is located in the village of Mikra Anogia which is just 3,5 km away from the center of Rethymnon town, its port and beautiful sandy beaches. It can accommodate comfortably 6 guests as it has 3 bedrooms and 2 bathrooms. You may relax by the villa’s swimming pool area with sunbeds and nice furniture. Our guests have rated this option as one of the top Crete holiday villas, as it is offered for low budget holidays in Crete. We had an excellent holiday; the villa is spacious, clean and well maintained with an excellent pool that was cleaned every day. The villa is about a 2km drive from Rethmynon. The view from the villa is impressive. Maria and Yannis were very friendly and helpful. We would recommend this villa and would definitely stay there again. The specific villa has 2 bedrooms, 2 bathrooms and accommodates up to 6 persons. It has a large private pool and private parking. It lays at a slope of a mountain with an excellent view of the bay of Mirambello to Sitia and it is only four kilometers away from Agios Nikolaos city and the sea. The villa is suitable for all year residence, as it has air conditioning for summer and independent heating for winter. 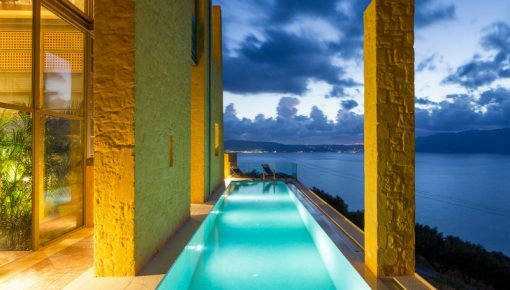 Amor is a fully private villa with infinity pool, located in Plaka. 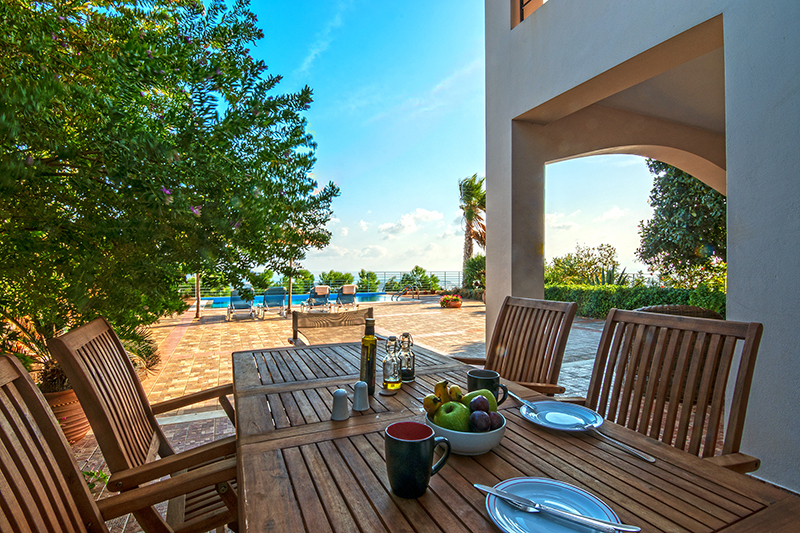 The villa offers breathtaking sea view and the surrounding area is full of green olive trees. It’s a unique property rented for first time this season after a complete renovation. 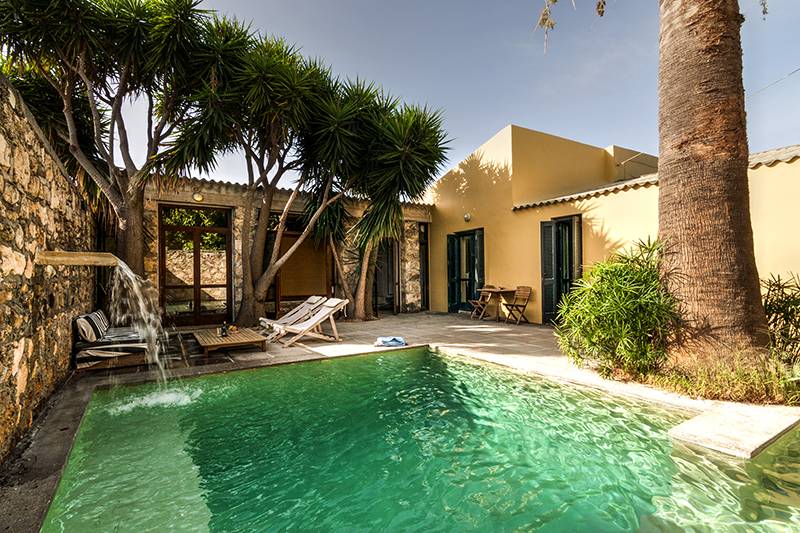 The villa which accommodates up to 8 persons in 4 bedrooms offers high standards accommodation, so it is fairly included in our top Crete holiday villas list. The newly renovated villa Ble with 4 bedrooms, 3 bathrooms and a private pool, is one of the most popular holiday homes in Akrotiri, in the village of Stavros, less than 1km from the beach. Chania, is about 25 minutes driving. In Stavros you can find all amenities easily, plenty of choices for sandy beaches around the villa. Two mini markets are about 1.5km away from villa Ble and many options for taverns and restaurants too. Chania, is about 25 minutes driving. Perfect house! The house was perfect for two families and the host was very helpful answering the questions we had. We will love to come back another time. 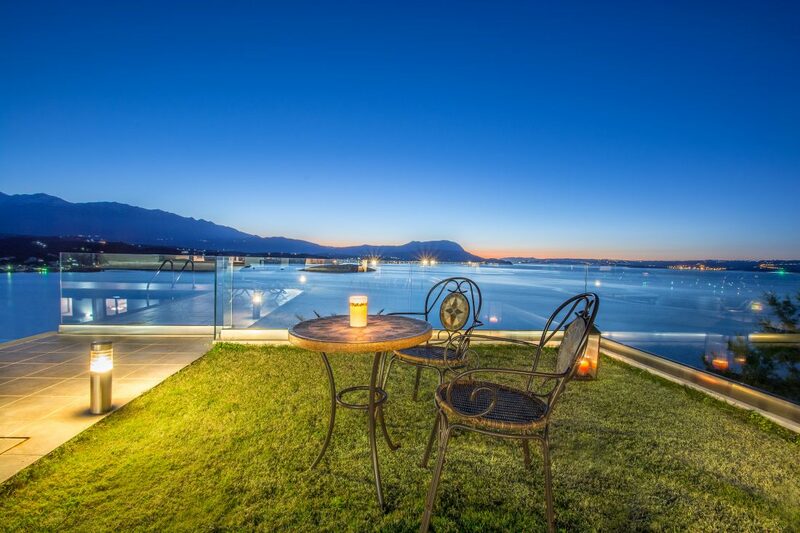 If you’re looking for a luxury retreat to spend memorable holidays with family, friends or your other half in Crete, then this private oasis awaits you. A perfect home away from home, accommodating from 2 to 10 persons, the splendid rental sits on top of an olive-grown hill only a short distance away from the famous and lively beach resorts of Maleme and Platanias and the beautiful city of Chania. 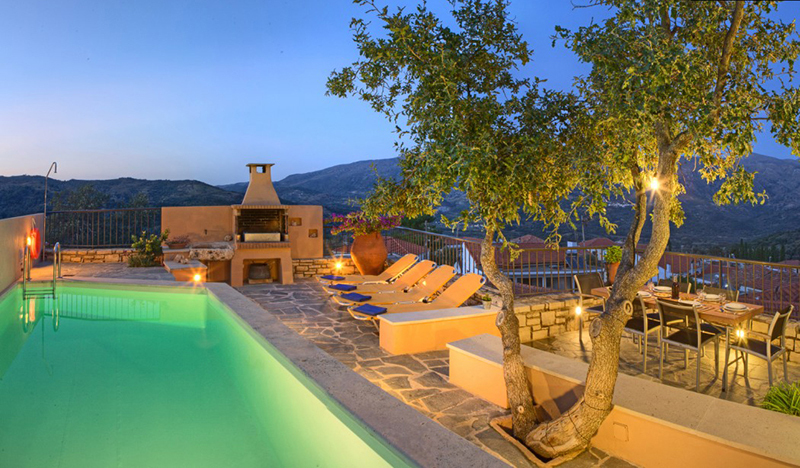 One of the best Crete holiday villas is offered in a really reasonable price. Fantastic villa! The villa and location were excellent. We were met with a warm welcome by Giannis on arrival with a well stocked fridge. The location of the villa was spectacular, situated as it is in an olive grove with panoramic views across mountains and sea. The outdoor space was wonderful and particularly enjoyed by our three children. I would have no hesitation in recommending this villa. Open balconies, charming arches, traditional wooden windows, shades and pergolas give the house cretan colour and character. 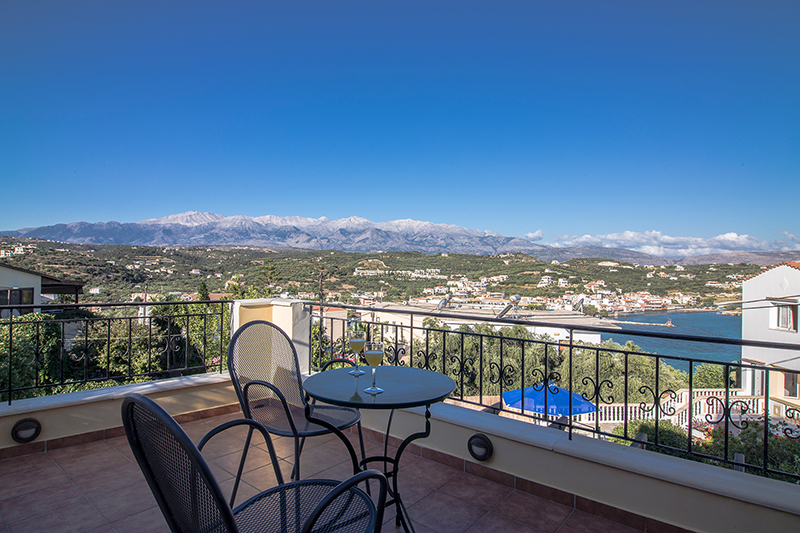 From the villa’s spacious balcony you can enjoy views to Almyrida, the bay, the green hills covered with olive-trees, extending to the impressive White Mountains. The evening sun offers a magnificent spectacle as it sets behind the hills of Chania. Built over a small cliff overlooking the picturesque bay of Almyrida, the villa is just 3 minutes walk to the sandy beach and the village. The specific holiday home is considered as one of the best Crete holiday villas for family vacation. Beautiful villa with magnificent view! 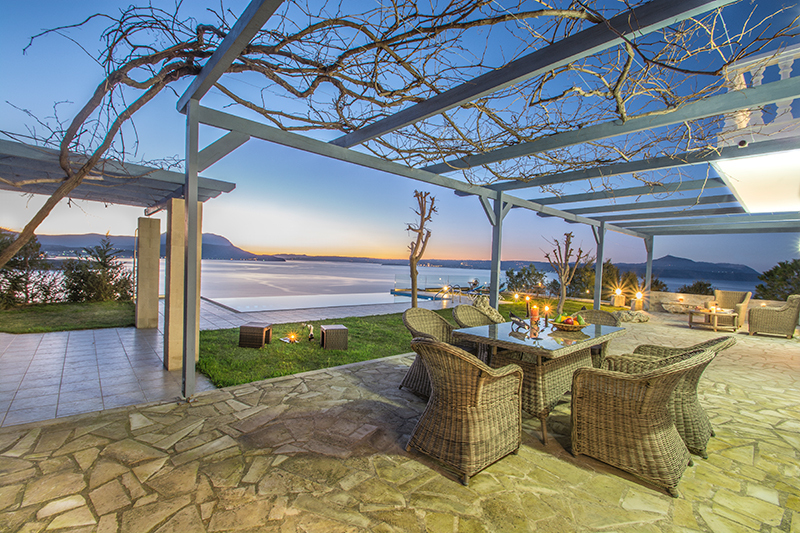 This villa is amazing offering the perfect location and accommodation in Almyrida. The villa is very spacious and cool with every detail and comfort included by the hosts in all the rooms terraces and outdoor spaces. The villa sits in a quiet location on a hill – a two minute walk to the village , and offers spectacular views across the bay . I have stayed in lots of villas and this is a true cut above the rest . Anna and her partner are really helpful and made us feel very welcome. I highly recommend this villa. Be our guest by registering on Cretico, browse over 470 Crete holiday villas, read reviews by other guests and choose the villa that suits you the most for your holidays in Crete! Posted on 07 Oct 2016 in Featured Posts, Holidays in Crete and tagged Villas In Crete.